Tag line: "Be Careful Who You Prank"
It's not unusual for a horror movie to have unlikable characters; I didn’t particularly care for the leads in either Welcome to the Jungle or Shredder, and felt that at least a few of those who suffered a grisly fate in these two films got what they deserved. 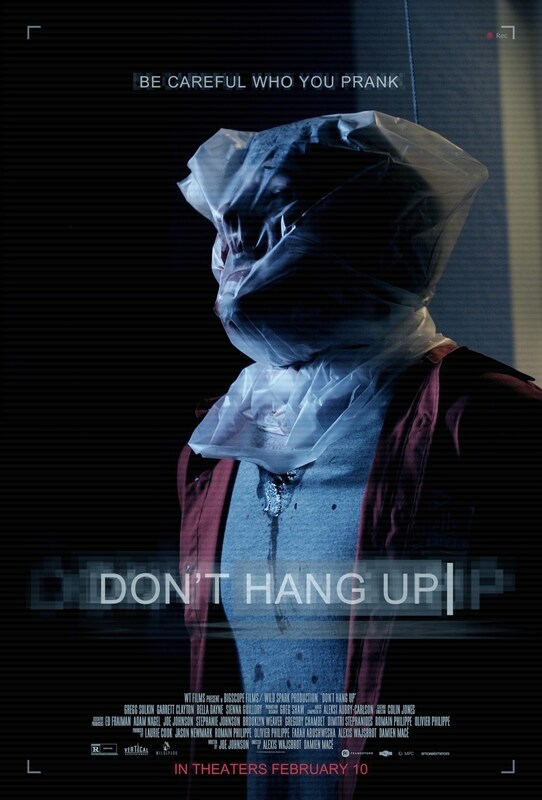 Well, after the opening scene of 2016’s Don’t Hang Up, in which some college-aged buddies pull a prank on a poor, unsuspecting housewife (played by Sienna Guillory), I can honestly say that I’ve never disliked a group of main characters as much as I did the idiots in this film, and right off the bat I was hoping none of them would make it out of the movie alive. Best friends Sam (Gregg Sulkin) and Brady (Garrett Clayton) are members of a group that specializes in practical jokes, putting ordinary people in horrific situations (children held hostage, death of a relative, etc), then posting their victim's reactions on-line for the world to see. Their prank show is wildly popular, and Sam and Brady, as well as their partner in crime Mosley (Jack Brett Anderson), have become minor celebrities as a result. But Sam is down in the dumps; his relationship with longtime girlfriend Peyton (Bella Dayne) seems to be falling apart. To cheer him up, Brady spends the night at Sam’s house (Sam’s parents are out of town), eating pizza and pranking random people on the telephone. But when one of their pranks goes awry, the two find themselves being stalked by a man known only as Mr. Lee (voiced by Philip Desmeules), who seems to know an awful lot about them. In fact, Mr. Lee is so clever that he's even managed to track down their nearest and dearest, putting both Peyton and Brady’s parents (Alex Dee and Jane Ryall) in the greatest of danger. Who is Mr. Lee, and why is he so angry? Before the night is over, Sam and Brady will figure out the answers to both these questions, but doing so may very well cost them their lives. So, yeah, I hated the main characters in Don’t Hang Up the minute they popped on-screen during the opening credit sequence, and I was anxious to see what terrible fate awaited these douchebags as the movie progressed (their practical jokes weren’t just mean… they were downright illegal, and they should have been locked up for what they’ve done). Still, the movie does have a few things going for it, including the remarkable cinematography of Nat Hill, who (with a little help from the Speicial FX department) put together some very cool shots early on. In one, his camera swoops through the keyhole of a front door, flies low over a few knick-knacks on a family room table, then comes to a rest in the kitchen, where Sam is staring at his laptop, contemplating his failing relationship with Peyton. It’s an ingeniously-staged sequence, and the camera continues to move freely throughout the movie, infusing each and every scene with an undeniable energy. In addition, the two main leads do a decent enough job playing a pair of morons (though Gregg Sulkin’s American accent does slip a bit when his character gets excited). As for the story itself, it’s definitely nerve-racking, and Don’t Hang Up had me poised on the edge of my seat right up until the final act. Which is exactly when things begin to fall apart, thanks mostly to a series of late plot twists that are as predictable as they come. In fact, I was able to figure out three of the movie's major twists well before they were revealed (and If I can do it, anyone can). I don’t usually assign ratings to a movie, but if I was to rate Don’t Hang Up, I’d give it two out of four stars. It’s not the worst horror film I've see this year, but it won’t be making any of my top-10 lists either.